Take a picture in your favourite Orchid corset, lingerie or accessory. It can be a selfie, taken by a friend or even a professional photographer if you like! Tell us how you feel when you’re wearing the garment! Do you feel powerful? graceful? confident? sensuous? Some top tips for entries that make an impact! Be creative! Choose a beautiful or unexpected location for your shot- sometimes a dramatic backdrop is right around the corner! Get friends involved! Either helping to take a great photo or even posing with you! Couple shots are very welcome! Lighting is key- make sure we can see what you’re wearing! Remember we want to see ALL our clients! It would be lovely to see some of our male and trans clients strutting their stuff this year! Be aware that we may share entries on social media so feel free to disguise your identity if that’s what you’d prefer to do. Multiple entries welcome! The more the better! 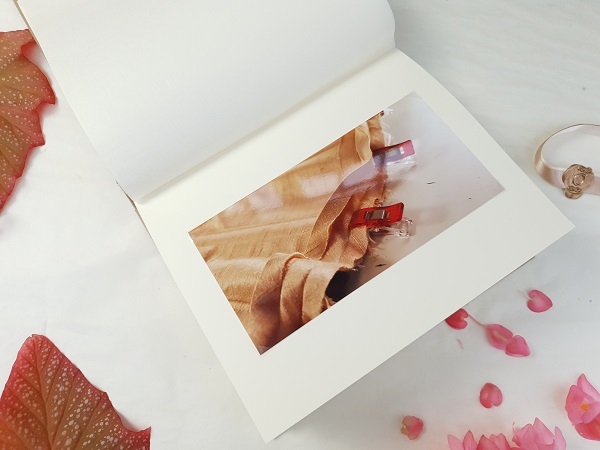 The images in this post are from last year’s competition winner Amethyst Skye, with most photos taken by Diana Suder. Remember- the deadline is the 30th April so don’t delay- shot today! I’m really excited to talk to you about our Creation Stories project. This idea was born from a wedding gift for dear friends who asked me to make their bridal corset, and requested photos of the work in progress, to get a glimpse into the construction and process behind their garment. I decided that I would go one better, and make them an album, mixing creative writing and photography to show them how I work, and some of the stages that might surprise them. As I saw things coming together I realised the potential for my other clients, many of whom are deeply interested in the “behind-the-scenes” world in the studio. And I can see why- corsetry is a world apart from dressmaking and other sewing projects. It blends engineering, tailoring, architecture and uses a mystifying array of archaic tools! And each project demands something different. It might be our terrifying looking metal punch or our oddly shaped and bent applique scissors for fine lace work. So I thought why not offer our clients the chance to have their own Creation Stories? 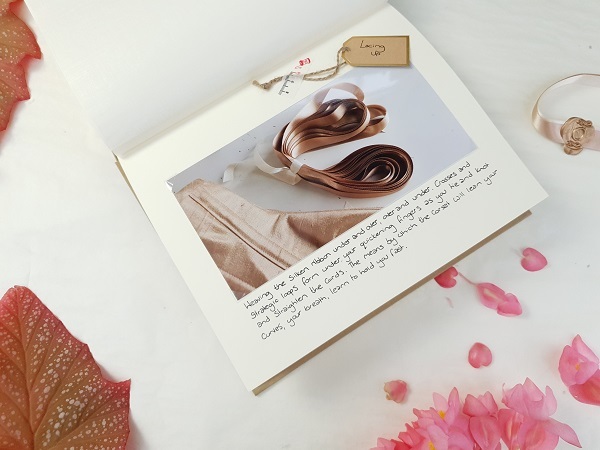 A linen covered album, sealed with a wax stamp, with delicate tissue paper separating handwritten notes by the maker, and photos of all the different stages that brought your treasured garment from cloth on a roll to an intricately stitched second skin, threaded through with steel and made with great care. 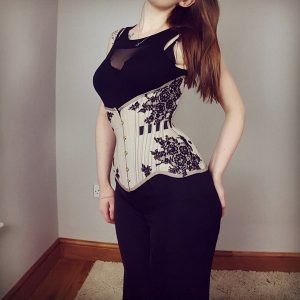 You might be surprised at the techniques and tools that helped us make your bespoke corset! 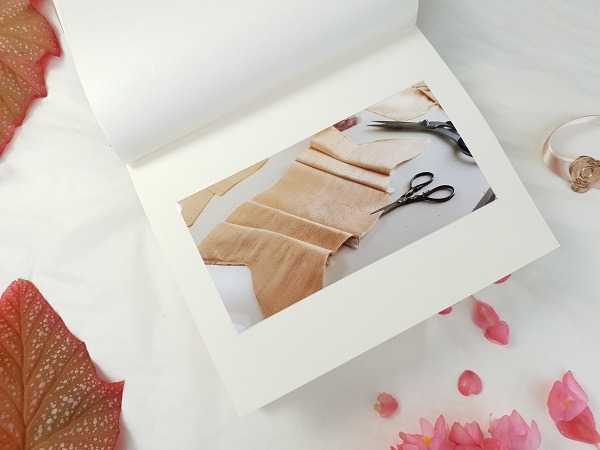 So from now on, if you’d like a Creation Stories memory book to document the making of your bespoke corset you only have to ask! 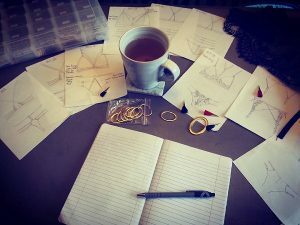 Each one will be as unique as your commission, featuring the tools and processes used in the creation of your corset. Prices on request. 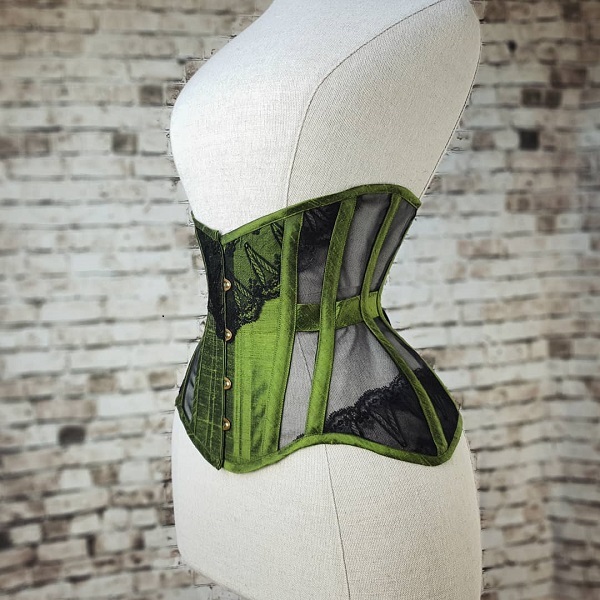 If your loved one has commissioned a special corset for their wedding day or a special event then what could be a more thoughtful surprise gift to present them with! Each year, the last order dates for Christmas sneak up on me! We’re skipping merrily through October and then suddenly I’m all booked up till Christmas and I don’t know where the time has gone. I had plans for a gift guide this year but by the time it was appropriate to post it (I hate bringing these things up too early!) We had so few spaces left for realistic on-time delivery that it seemed rather pointless. To be clear. at this point you are welcome to order but we can no longer guarantee that your order will be be completed in time for last post dates. Smaller items like chokers or harnesses are ok but corsets and lingerie will be sent in January! We still have gift vouchers though, if you missed the boat! However there is still a reason to get your orders in now if you can, as in January we will be raising our prices by around 10% across bespoke and made to order pieces. I have mentioned this in passing on Social Media but for those of you who have found us more recently I have put this off for over 3 years now, despite our costs going up. 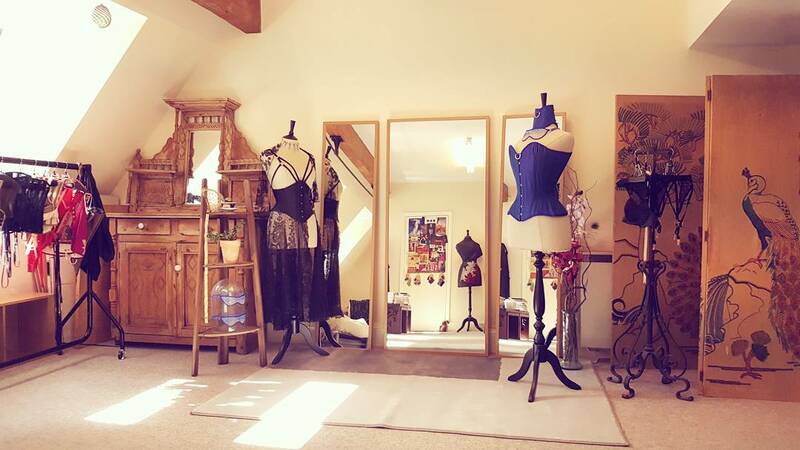 I’m reluctant to raise prices as I know how much of an investment corsetry is for our clients, many of whom are not wealthy but are passionate about supporting our work. Please know that we truly appreciate the choices you make! But I trust that the craftsmanship and care we take with our client’s requests will continue to speak to the true value of what we do. Please feel welcome to place orders through the online shop or contact us for your bespoke requests if you want to secure your 2018 prices. Remember that bespoke quotes given now will only be valid until the end of December, and you will need to pay your deposit before then to secure the quote. I’m looking forward to 2019 and working with clients old and new! I intend to spend the Christmas break (21st December to the 7th January) thinking about the creative direction of the business. I love what we do but I feel that I’ve lost some focus on designing in what I can only describe as an “authentic” way. The pieces I’ve made that get the greatest response from you are the ones where I was really digging into my personal aesthetic and influences but somewhere along the road last year I feel that I fell into a bit of a ditch of trying to predict the market instead of being true to my own instincts. I’ve never been a commercially minded person (despite the need to make a living!) and to me this really is an art form, it’s my main creative outlet and it still brings me so much joy. So I want to have the bravery to return to that scary, vulnerable place where you face the public with a piece of your soul, asking those people to join you on a journey where you haven’t quite picked an end destination but you have planned a scenic route. And you packed cookies. As always, thankyou to everyone who has been with us so far, you are great travel companions! May your holiday be happy and filled with loved ones, whatever you choose to celebrate. 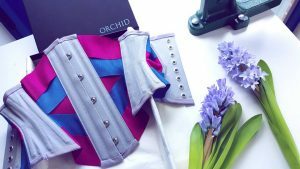 2017 In Review- A Year At Orchid. Here we are again friends, we wave 2017 off in a fanfare and think about our goals for a new year! At Orchid there has been a lot to celebrate, though I won’t pretend there weren’t a lot of difficult days inbetween! But I did want to share our year with you, a behind the scenes glimpse into life at the studio, and all the adventures we’ve enjoyed along the way. Thankyou to everyone who has joined us for the ride! Your support and interest make it all possible. In the cold dawn on a new year, I began designing our Heartland collection, following a move back to my motherland of Wales in December. From the start I had a strong feeling about the designs, which felt cohesive and bold, and really just ran out the end of my pencil! I also began making plans with my web wizards at Moghill for a new streamlined website with a more accessible online shop. I felt so invigorated with plans and ideas for the business, and was excited to make them a reality. My 30th birthday! Working between Wales and England was starting to take it’s toll as I had a 3 hour daily commute to the studio and was trying to find a way of setting up a workspace in Wales. But every challenge is an opportunity, and while plans for that were underway I was using my train commute through the valleys to work out ways of accommodating the requests for wholesale orders I was starting to get from overseas boutiques! Cue the lovely Amy joining me for a training day! At last- after 3 months of commuting I found a place to set up with space to move production! This left my lovely Shrewsbury space free to dedicate to client fittings, while allowing me a moment to redesign my workspace, with standing height bench for pattern cutting and pinning. I can’t begin to tell you what a difference it makes at the end of a long day without stooping! Having an extra 3 working hours back in each day meant I could get back to sampling the new Heartland collection and plans began to develop for the new website! 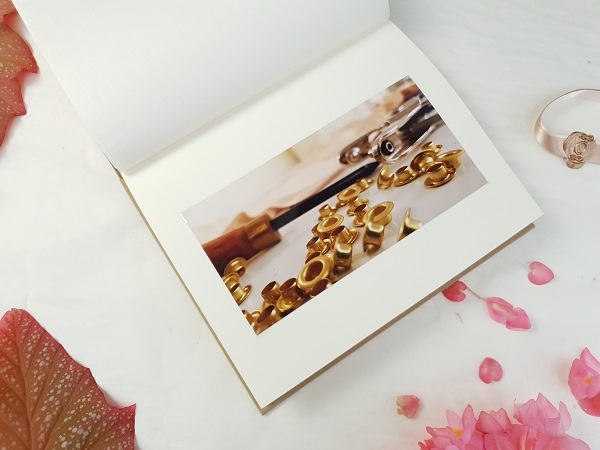 April was just packed with lovely orders, and fun photoshoot collaborations! A huge joy of the job is the unexpected combinations that clients bring my way, such as this ribbon corset, made in grey coutil with alternating fuschia and deep teal grosgrain ribbons. I will admit that I couldn’t quite picture the result when the client decided on it, but I had a feeling it would be stunning! Speaking of joys of the job- in May I worked on a second corset for a very special client. 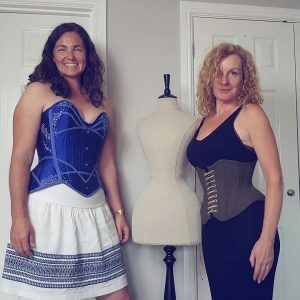 We began working together in 2016 and in collaboration with the ladies occupational therapist I designed a corset that would work with her mobility limitations. My client was a wheelchair user and needed a corset that would offer great back support but be easy for her care team to put on every morning, we came up with a fully front opening and adjusting design. She liked it so much that in May this year, she ordered another in black! June was a tumultuous month for Britain. Still reeling from the Manchester bombing, we saw an attack on London, just days before the general election. I felt so proud of how our citizens reached out to those who were affected, donating blood, making cups of tea for the dazed survivors and opening their homes and businesses as shelters. In amongst the hatred of a few individuals, a nation came together. And of course, we carried on sewing. Well by this point, I had the Heartland collection complete and ready to go. 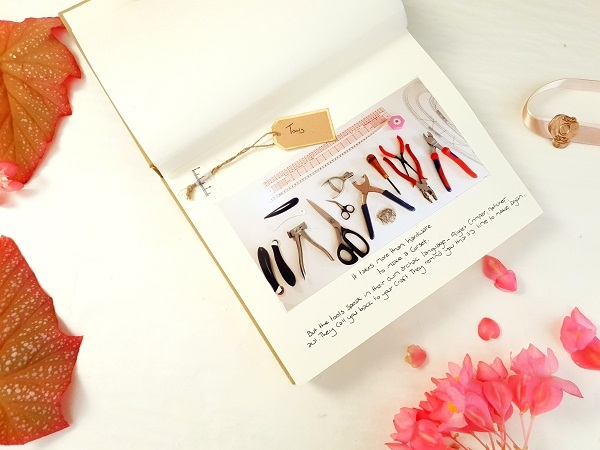 But I had made the decision that I wanted to wait to release it until the website was finished, as the new shop would make such a difference to how people experienced it. So cards were still close to the chest! I passed my driving theory test (a “now I’m 30” resolution!) and these lovely ladies came to try on some corsets and get measured! My best friend from college, Emma, got married, and asked me to be her best man! 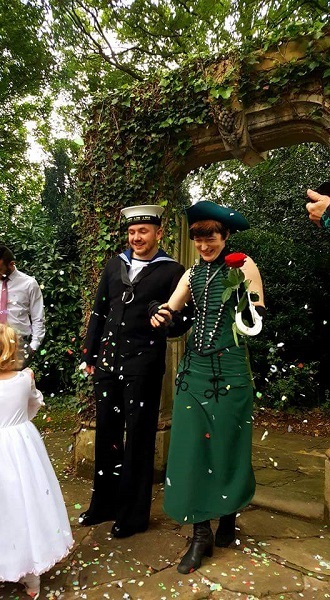 I had the great pleasure of making her wedding corset, which was inspired by the Napoleonic uniform of the 95th Rifles- or Sharpe, if you’re a Sean Bean fan! Her husband is in the Navy, so they were both in uniform! A truly beautiful day, that ended with the Perseid meteor shower. Inbetween client orders I try to find some time to experiment and develop my skills. I finally finished the 20 panel corset I’d been making for myself (full blog post to come!) and embellished it in time for a charity Ladies Day I was speaking at. We raised money and awareness for Crane Counselling, which is building a nationwide service, based in Shropshire. I also gained my first US stockist! You can now buy our corsetry at the gorgeous Anya Lust! Everything was gearing up in October. The site was nearly ready to launch which meant long nights of adding products, learning new systems and rewriting pages! 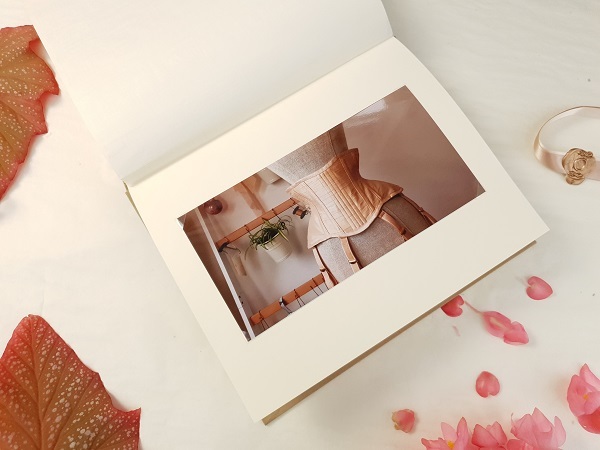 I also took it upon myself to design a few extra pieces for Christmas, including our Isolde neck corset, which is designed to reduce our waste of luxury fabrics even further and add something different to our standard size collection! It was with great pride that we launched our new website and the Heartland collection! I’ve been so thrilled with the reaction to the new designs. It seems that many of you share my own favourite set- the Adara! There were some lovely orders taking advantage of our custom colour corsets. Oh and one other small thing… after nearly a year of lessons, I passed my driving test first time! December is always crazy, even in the slow fashion sector! The week before we broke up for Christmas was a real challenge. Making sure that January’s clients were ready to go when we got back to work, ensuring couriers got overseas parcels, and running headlong towards the last posting dates! When it all came to a close I was feeling victorious, but really quite run down, so it was really rather special to have a bit of a Christmas miracle. You see, I’ve missed out an ongoing saga that has been running since August. I put an offer on my first home which was accepted! Through all the intervening months there has been a long struggle with mortgage applications and all the legal stuff that accompanies house buying. No stage of this has been easy, and at the end of the working year there still hadn’t been a final confirmation on the mortgage. I was resigned to there being no more progress till January, but on Christmas day, I heard that they had finally approved everything! As sorry as I feel for that person, working at 5pm while everyone else was sleeping off their dinner, it meant the world to have that piece of the puzzle in place! So although we’re still waiting on a few more details, it seems pretty certain that in 2018, I will be able to move Orchid to a permanent home studio! This will change some of the ways we work on fittings with clients but the freedom and security I can now look forward to is very exciting- I look forward to sharing the adventure with you! It’s been longer than I realised since I sat down to share our news, but in my defence it’s been a busy couple of months! In addition to the usual commissions and photoshoot plans, I’ve been moving the studio and changing the Shrewsbury address into a dedicated client space and fitting area. 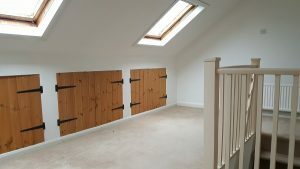 I know some of our readers will have visited us at Charlton House for their consultations, and we get lovely feedback from clients about how much they love our town and the funny little attic space we call home. For those who haven’t climbed our stone steps, Orchid HQ for the last 6 years has been up in the eaves of a converted medieval manor house, which still has the stunning exposed stonework of the original building as you enter! My sunny little garret looks out over the rooftops and chimney stacks of Shrewsbury town centre, and is a wonderful little creative hub. We also have a friendly ghost called Lady Sarah, according to the local paranormal tours. However it has always been the dream to separate studio life into a fitting space and workroom, so more space can be dedicated to display and scene setting with clients, and I can be free to make creative muddles and spread out as the commissions fill the work table. A recent home move back over the border to Wales has increased this desire, as it’s a long daily commute! 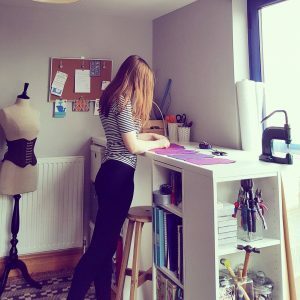 But I’ve found a perfect temporary workspace back home, which has enabled me to do long awaited things, like setting up a proper height pattern cutting table so that I can work standing up at long last! It’s been fantastic to have a driving force behind all the things I’ve been waiting to do for the business, and the resulting studio is a pleasure to work from. After nearly 11 years in business it was high time that some updates were installed! Hard at work at the new desk. But the real investments have gone into the fitting area. It’s still a work in progress with a long way to go but the additional space in the Shrewsbury address instantly created opportunities. There is now a huge three part mirror so clients can view themselves from all angles during a fitting, with a sumptuous rug and racks full of samples to be explored. The mannequins gather around, dressed in their own finery to intrigue our visitors, and of course, tea is waiting to be served! The antique changing screen, embroidered with peacocks by my great grandmother still graces the corner, waiting for you to try on something precious and fall in love. 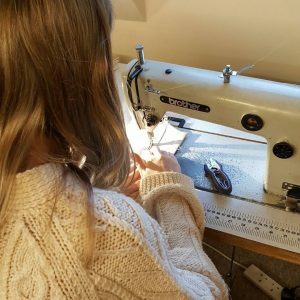 There are many more jobs awaiting me in the fitting space but for now, it’s a lovely work in progress, and I will be delighted to welcome you to the studio area for your own bespoke commission! 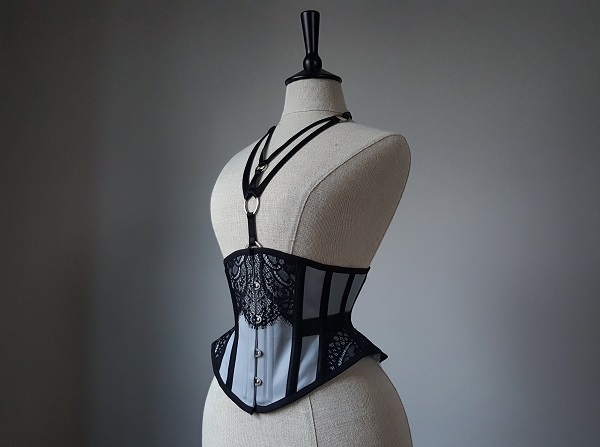 Our waiting list is already filling up through the summer but there are spaces for special projects and made to order corsets from our online store.